I’m so in love with the taste of parsnips! My favorite way of preparing them is making parsnip fries. Super easy and, when ovenbaked, a healthy alternative for original potato fries. This time I paired the parsnip fries with stewed white cabbage, only added a little stock powder and curry powder for taste. Just a beef tartare, with only some pepper and salt, to finish the dish! 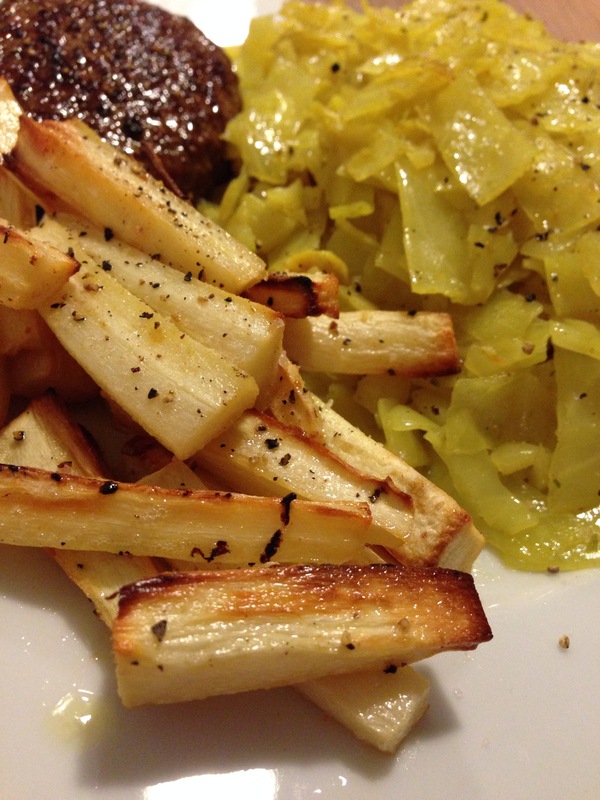 Parsnips, sliced into fries-like pieces. Preheat the oven to 225 Degrees C. Drizzle some olive oil on top of the ‘fries’, shake well and bake in the oven for about 30 minutes. Give it a stir halfway through. When finished just sprinkle a little pepper and salt on top. Heat a little oil or butter in a pot, add the cabbage and bake for about 2 minutes. Add the stock powder and curry powder and a little splash of water. Mix well and then add a lid to the pot. Stew for about 15 minutes until the cabbage is soft and tender. Give it a stir every once in a while. I had a beef tartare to go with the cabbage and the fries, which I only baked for several minutes in a little butter. It doesn’t need anything but a little pepper and salt! Posted in Diner, recipesTagged cabbage, dinner, goodfood, healthy, healthyfood, parsnip, veggie, veggiesBookmark the permalink. Eef! Wanneer ga ik weer lekkere recepten van je voorbij zien komen? Tijd om je blog weer leven in te blazen! Ik ben genomineerd voor de Liebster award en heb hiervoor jou weer genomineerd. Lees er meer over op mijn blog!